Today, I'm bringing you a round of "in case you missed it" links. No matter where your fandom rests, you'll find something of interest here. Read on for unfortunate makeovers of beloved characters, cool DIY Star Wars shoes, a scarlet fever update, a spirited Twilight defense, and crochet Doctors. I imagine many S4 readers loved the Anne of Green Gables books as much as I did as a girl. Anne, while certainly not in the sci fi/fantasy realm, was a gateway character to the other strong females leads we'd love later in life. Well, the books have entered the public domain. This means the much-read, much-loved tales of everyone's favorite "don't call me carrots" redhead can be republished and sold by anyone who wishes. 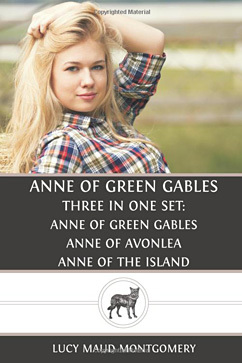 And they can put whatever cover they want on their Anne books. I don't ... I can't ... I ... what? That's our Anne with an e? Our Anne of the Titian hair? As we all know, our beloved Anne is a skinny redhead who would never arch her back while hungrily eyeing the camera in a questionable plaid shirt. Just for fun, here's a recipe for raspberry cordial. Haven't you always wanted to try some? Reading certain chick lit (ugh, that demeaning literary designation) can make women feel more insecure about their own bodies, according to research from Virginia Tech. Researchers found that women felt sexually insecure when reading about thin heroines, and they felt more insecurity about their own body weight when reading about insecure heroines. This got me thinking about genre heroines, especially in urban fantasy. In my reading experience, these women are usually strong, capable fighters without many body hangups. You don't hear them moaning about having to diet or obsessing over squeezing into a pair of jeans. (And yes, I'm grossly oversimplifying the kinds of storylines you see in chick lit to make my point. I love me some Bridget Jones, which incidentally is getting a third book in November, which could be great but which probably will be terrible.) 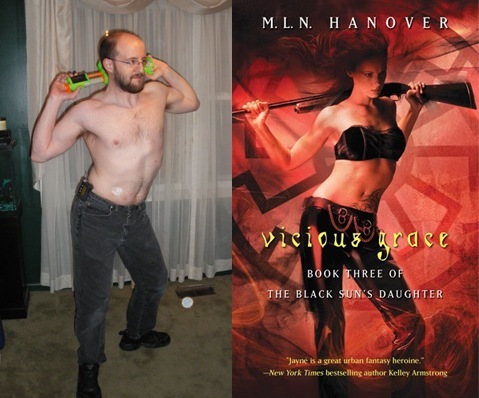 Yet weirdly, it's the urban fantasy women who get the most skin-baring book covers, as brilliantly spoofed by fantasy author Jim C. Hines. This is a phenomenon I've never understood. Check out more poses on his blog. Anyway, it made me wonder what these strong UF heroines might do for the self-esteem of female readers. Would their strength and fitness lead to readers feeling less sexually confident, or more so? Sounds like a possible follow-up study. 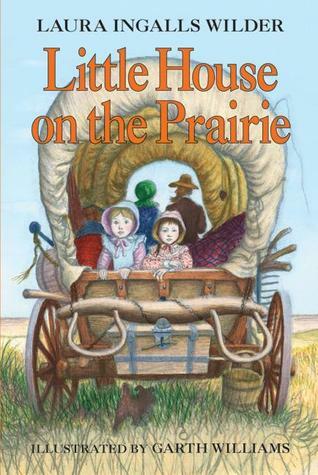 Turns out, scarlet fever may not have cruelly robbed Laura Ingalls Wilder's sister of her sight. As readers of the Little House on the Prairie books can attest, one of the saddest and most shocking moments of the series is when it's revealed in By the Shores of Silver Lake that scarlet fever has settled into Mary's beautiful blue eyes and left her blind. However, during Dr. Beth Tarini's pediatric rotation in medical school, she learned that scarlet fever doesn't typically result in permanent blindness, so she and her research team began reading historical letters and newspapers accounts of the day to glean information about Mary's symptoms and epidemiological patterns in the 1800s. They eventually found enough anecdotal data to hypothesize that Mary lost her eyesight to viral meningoencephalitis, which inflames the brain and the optic nerve. So why the literary switch to scarlet fever? Tarini suggests it's because Wilder and her editors believed readers might be more familiar with that common ailment, which also pops up in Frankenstein and Little Women. You can read the full story here. I don't know about you, but my childhood fear of scarlet fever has been shaken to its core. But hey, medical anthropology FTW! 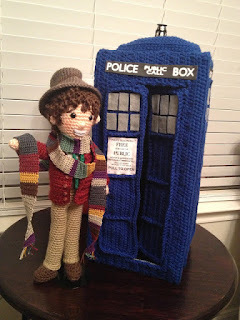 Allison Hoffman of CraftyIsCool.com has created crochet version of all 11 Doctors, plus the TARDIS. Holy bigger on the inside, are they neat. Crafty readers can buy the patterns on the CraftyIsCoolCrochet Etsy page. 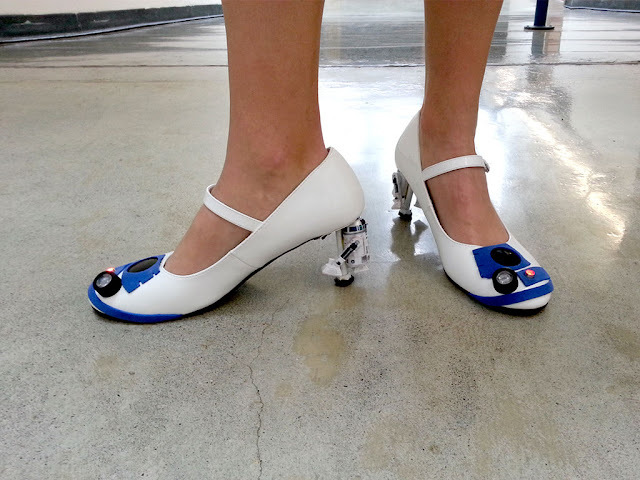 Mikeasaurus on Instructables.com has directions for making R2D2 heels. R2D2 heels! 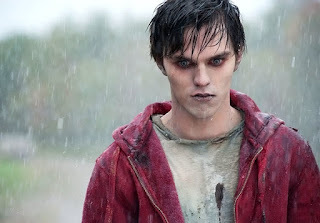 Jonathan Levine, the director of zom rom com Warm Bodies, gave an interview to All Things Considered on NPR about his box office champ movie. In it, he offers a surprisingly spirited defense of Twilight fans. "But now I'm starting to feel bad for the Twilight fans and I want to defend them, because there's this kind of like, inherent — whenever something is compared to Twilight, there's this kind of unspoken pejorative thing about it," he said. "As much as I didn't like the comparison because I felt like it make us sound like some cynical attempt to capitalize on a trend, now I'm a staunch defender of Twilight fans everywhere ... Whatever your taste is, there's a lot of people who love those movies and there's a lot of people incredibly devoted to those movies. And I think it's not nice to them." Preach on, brother Jonathan. Read what you love, watch what makes you happy, and keep your judgments to yourself. You can hear the full, charming interview here, and I frankly can't think of a better way to ease into the weekend. Many thanks to Sara, Sarah, Kel and Steph, who Facebooked me some of these links (or Facebooked each other these links, and I spotted 'em). What fresh hell is that Anne cover? In happier news, thank you for more Jim Hines. Is it wrong that I could look at his cover re-enactments all day?